While a for the album date has yet to be revealed, I could so see this happening. They probably have loads of music recorded together. They both are clearly big fans of one another. Jay says she's the best performer of our generation, and if you've ever seen Bey rock out at a Jay concert, you know she stans for her boo. Their collaborations are among the best. Their chemistry works so well. From the very first time they got together on Bey's debut solo single Crazy in Love to their grown turn up on Bey's latest album..the Carters make great music as a team. So, we shall see how this collaborative album works out. It should be cute, and I'm sure it'll be their most personal work yet (outside of Blue of course!) I'm keeping my ears to the streets about this one. Hopefully we will have more dets soon. 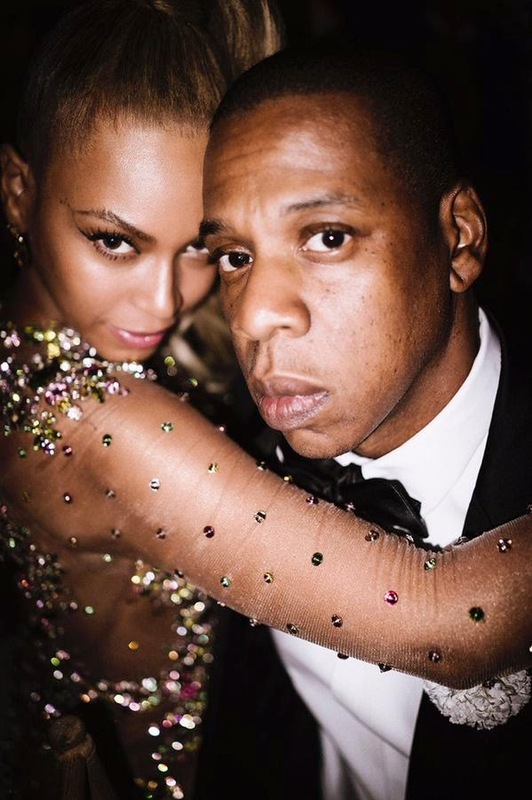 In the meantime, Bey and Jay are into more important things. Last night they met with the family of Baltimore native #FreddieGray whose murder is at the center of the most recent battle in the war of police brutality. Prince gave a "Rally for Peace" to encourage peace and uplift the energy there in Baltimore. The show was streamed by Tidal, and the streaming company also matched listeners donations to the Baltimore Justice Fund. Jay Z also gave a donation on top of whatever Tidal and the listeners were able to do. As a fan, I know that he does things like this all of the time, but it's cool for them to step in and get involved in this way. If you listen to Jay's music you'll hear him talk about his own experiences with the law growing up in hardtime Brooklyn. The whole rally seemed to go very well. Some in attendance said it felt like a complete uplifting of the spirits of folks who attended. 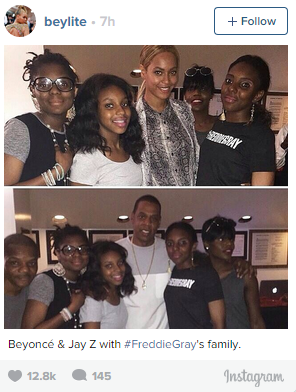 Jay and Bey posed with Freddie Gray's family as they all attended the concert/rally.